I have always been in awe of the English dessert trifle. The layers of sponge cake doused in alcohol, balanced with jelly, fruits, custard and cream is like the ultimate dessert to me. After sampling it a few times, I did a bit of research and found out that this dessert has a long history and a longer debate about what constitutes a proper trifle. Needless to say there are thousands of recipes out there. Some people swear by the jelly in the trifle, some dismiss it as a mere modern addition. But of course they are mistaken, jelly has taken it's place in trifle since the 18th century. Feeling a little confused and a whole lot overwhelmed, I shelved my trifle making plans. Till Hartley's sent me this trifle making kit and I just could not say no. 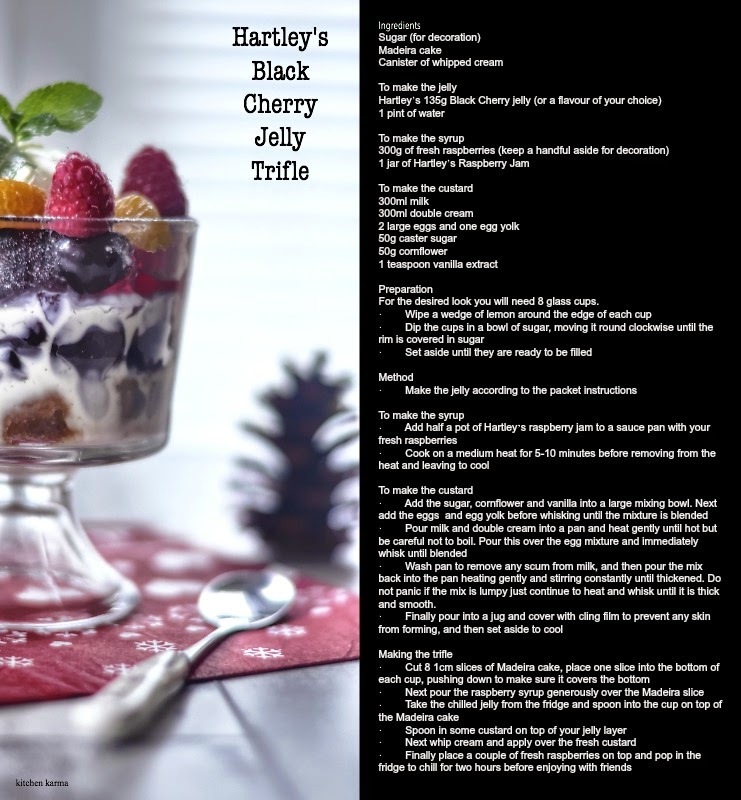 The star ingredient of this trifle is Hartley's newly launched Black Cherry Jelly. Since I never made a trifle before, I decided to stick to the recipe that Hartley's had sent me and it made a super indulgent trifle. Though next time I would soak my sponge cake in sherry to give it an adult kick! 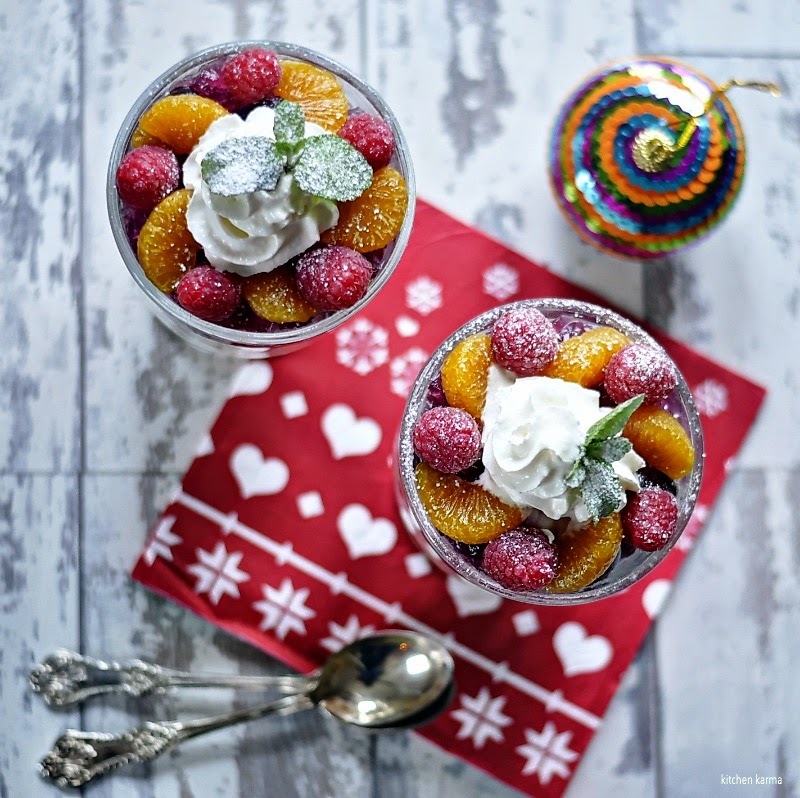 I think it's a perfect dessert for Christmas, specially since you can make it a day ahead and leave it in the fridge to set and there is always that wow factor when you bring out the trifle to the table. For the desired look you will need 8 glass cups. · Wash pan to remove any scum from milk, and then pour the mix back into the pan heating gently and stirring constantly until thickened. Do not panic if the mix is lumpy just continue to heat and whisk until it is thick and smooth. Thanks Hartley's Jelly for the trifle making kit and the recipe. 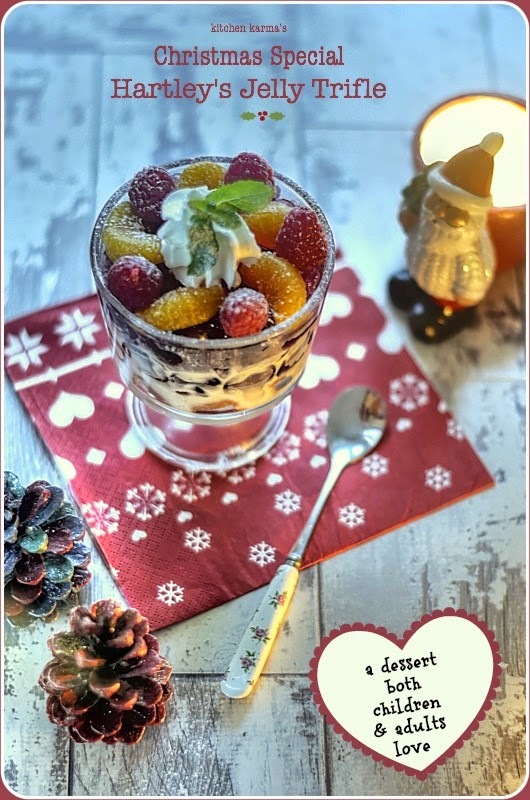 I sure enjoyed making the trifle and writing this post. I should not show this post to my son whose favourite dessert is this. but mine is not even half as gorgeous as this one. OH what a delectable trifle, Suchi. I've always been intimidated by the notion of making a trifle but I find them so tempting as well. Yours looks simply delightful. Awesome and delicious looking dessert.Wonderfully taken pics as well.